Wildy Research at CSUEB - LEARNING IS WILD! I am a behavioral ecologist with interests in behavioral ecology, herpetology and conservation biology. My Ph.D. research was conducted out of Oregon State University under the guidance of Dr. Andrew R. Blaustein. It involved an exploration of the ecological significance of cannibalism in populations of larval long toed salamanders (Ambystoma macrodactylum macrodactylum and A. m. columbianum). Generally speaking, I am fascinated by agonistic interactions larval amphibian populations. But with this said, I am interested in studying any number of behavioral and ecological questions involving urodele (salamander) and anuran (frog) species. Although my past research has primarily focused on population-level questions, I am certainly open to projects at the community and ecosystem level and on alternative models as well. I am extremely passionate about student learning in STEM and have begun to dedicate most of my research and scholarship efforts toward initiatives focused on student learning in biology at the level of the college and university. My interest in this area of scholarship is really just an extension of my love of teaching and working with students. One of my latest passions is the field of informal science education. Informal science education refers to science learning that takes place outside of a traditional classroom. These alternative venues may include museums, aquaria, and zoos amongst others. I am very interested in engaging in partnerships with informal science centers to further science literacy in students as well as the general public. 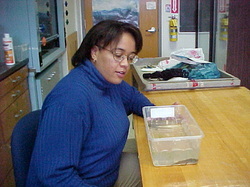 My interest in informal science education was fueled by my almost two year stint as the Senior Science Educator at the California Academy of Sciences (The Academy) in San Francisco. My responsibilities at The Academy included providing docent training, developing exhibit copy and creating supplemental materials (e.g., scavenger hunts). I look forward to taking what I learned from my time at The Academy and using it in my role as an Associate Professor in Biology at CSUEB. One area in which I can do this is with the biology department's own natural history collections. In this collection we have thousands of specimens of marine invertebrates, insects, fishes, amphibians, reptiles, birds and mammals. However, the facilities in which these specimens are stored are not sufficient for long-term storage of these specimens and we do not have a regular staff to help maintain the collections. My goal is to secure funding and volunteers/staff to help adress these issues. I am also interested in partnering with an informal science center(s) to provide graduate students with projects that they can complete for their Master's Degrees. Currently, I am working with the Oakland Zoo to establish a partnership of this nature.